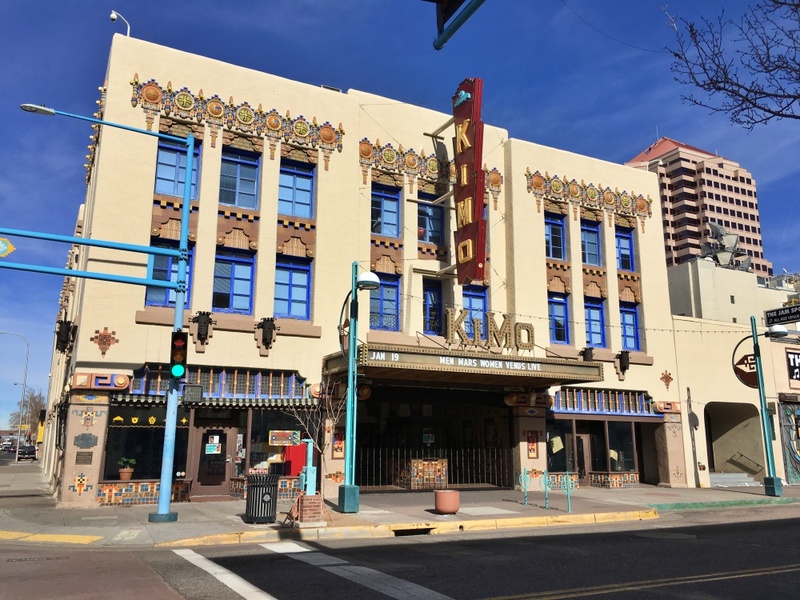 The KiMo Theater is arguably the most colorful & the most architecturally interesting building in the MetroABQ. 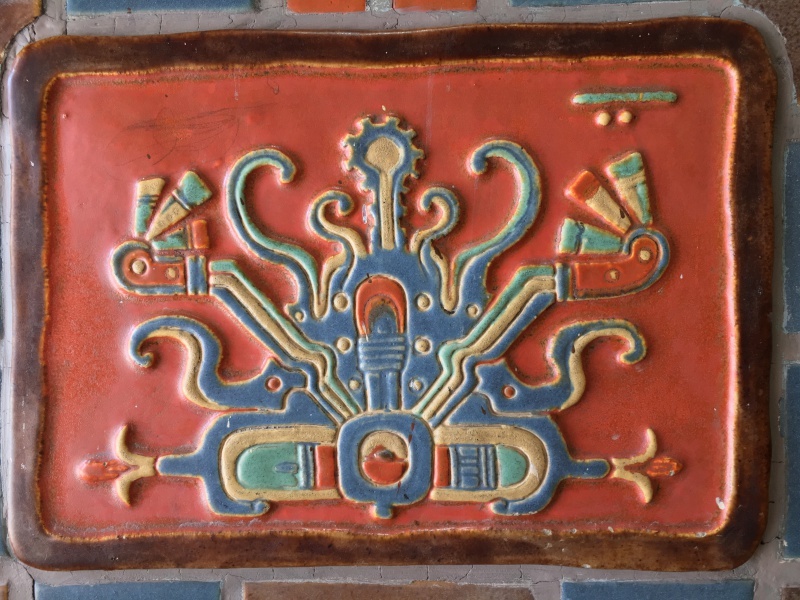 Found on Route 66 downtown between 4th & 5th Sts, you can't help but be drawn to the protruding ornaments, considerable tilework & intricate murals that adorn the Central Ave façade. 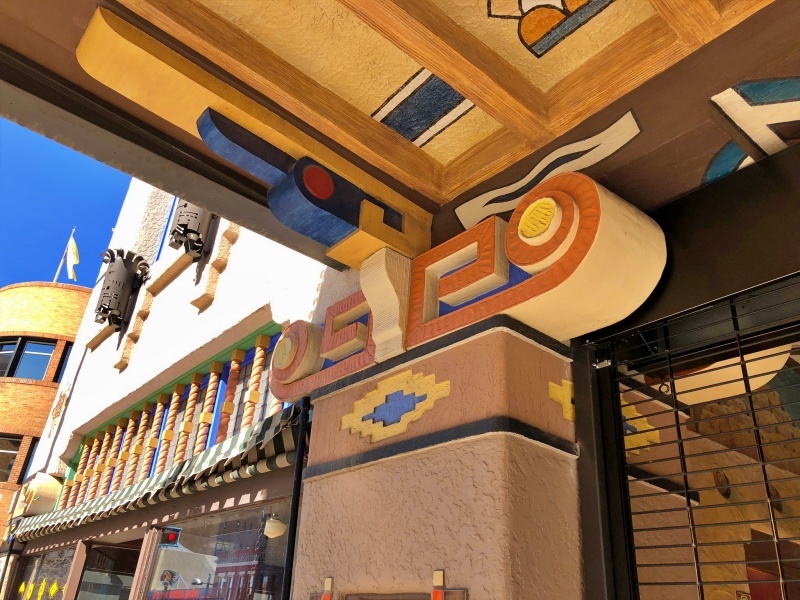 Those three elements are integral to classic Pueblo Deco architecture, which is a mix of Pueblo Revival & Art Deco styles--a uniquely Southwestern creation. 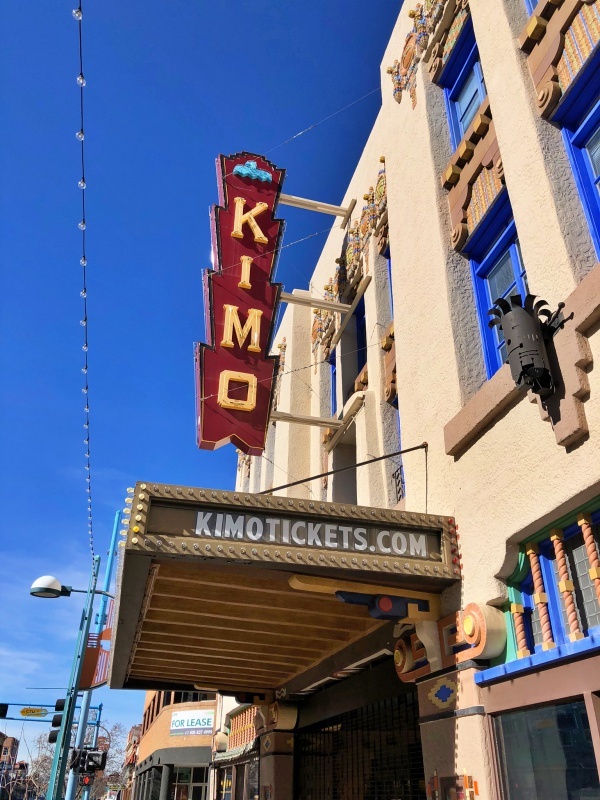 Completed in 1927, the KiMo Theater describes itself as a "Pueblo-Deco picture palace & vaudeville theatre. 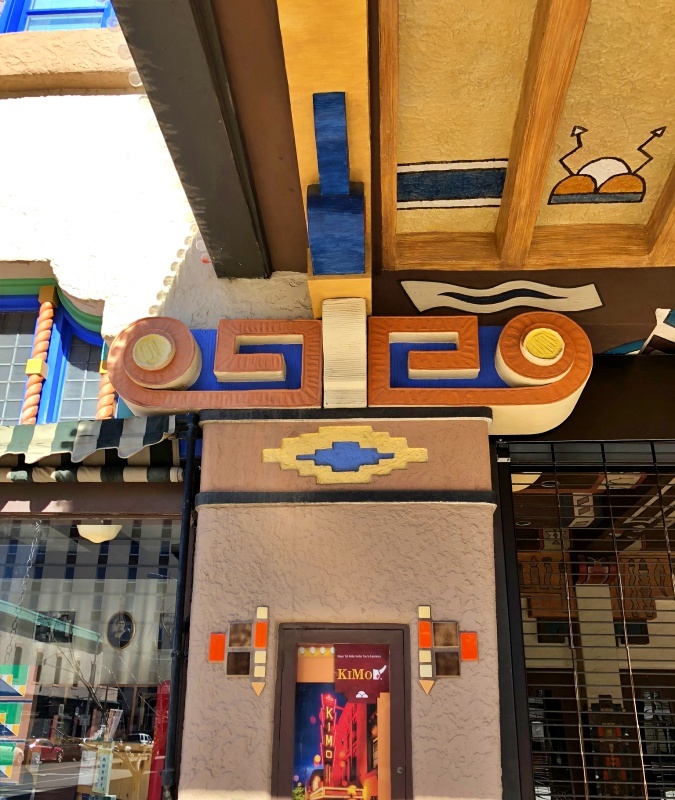 Pueblo-Deco was a flamboyant, short-lived architectural style that fused the spirit of southwest Native American cultures with art moderne elements, popular during the 1920's-1930's. 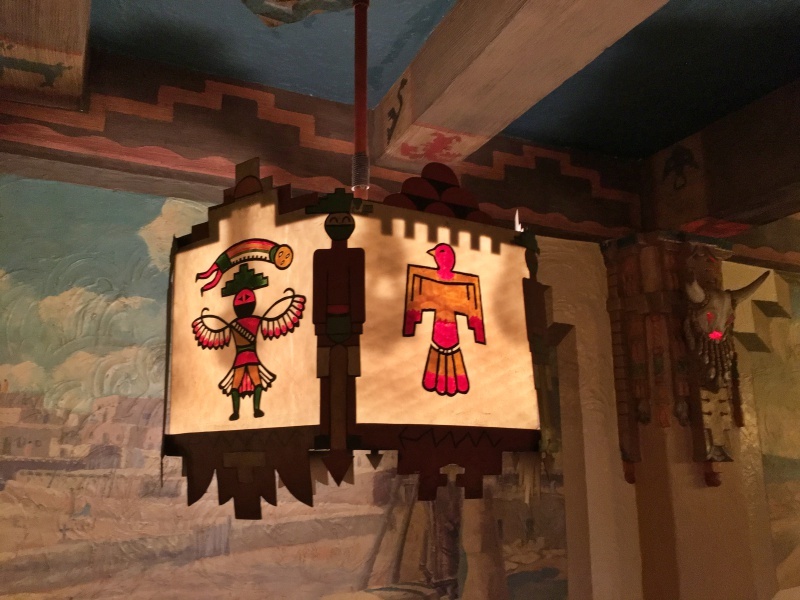 "The interior included plaster ceiling beams to mimic actual wood vigas, colorful Indian symbols, air vents disguised as hanging Navajo Rugs, war-drums, Native American death canoe chandeliers, wrought iron Sandhill Crane railings, shields & buffalo skulls with red glowing eyes." 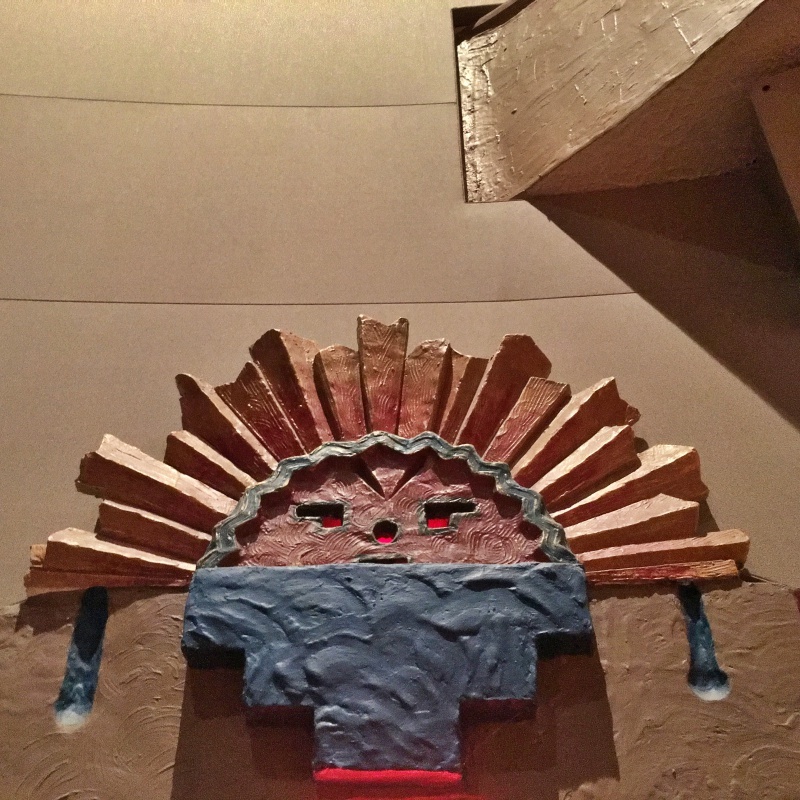 The owners & builder created an interpretation of native culture, borrowing some themes & designs--even incorporating what seems like Pacific NorthWest tribal images into the mix. 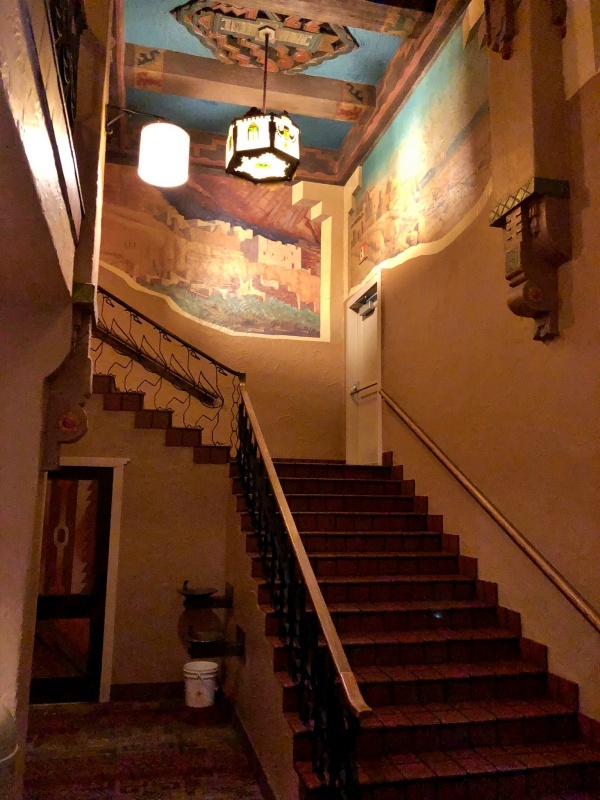 I was fortunate one afternoon to be part of a tour guided by KiMo Manager Larry Parker, who was very gregarious & entertaining, & provided a wealth of knowledge about the historic building. Below the marquee, below, are three images of the front entrance & interior lobby. 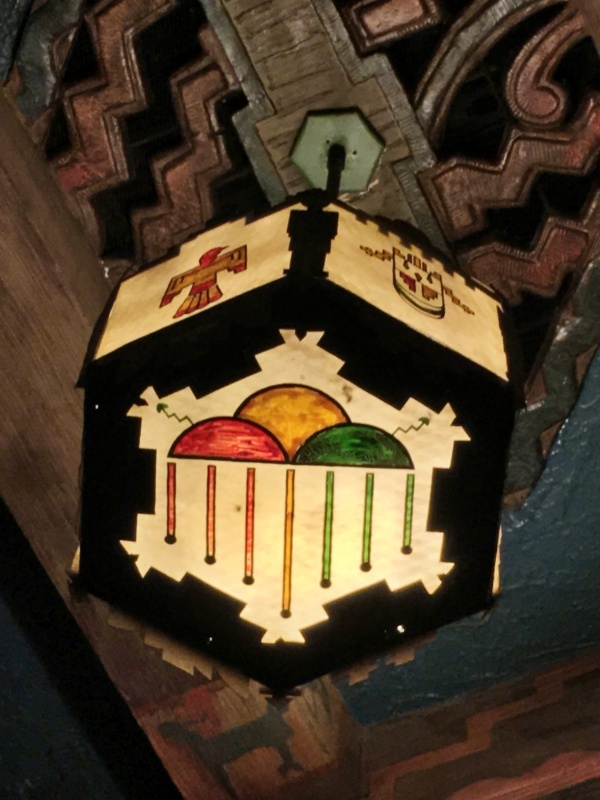 The KiMo Theater, built by the Bachechi family, has gone through a few incarnations over the years. By the 1970's, it had become run-down & was an adult film theater. A fire around that time damaged large portions of the stage area; soon after it was shut down. Slated for demolition, the city bought the building in 1977 & began running it as a performing arts center, with offices upstairs. Years later, a public vote allowed the city to restore & renovate it. 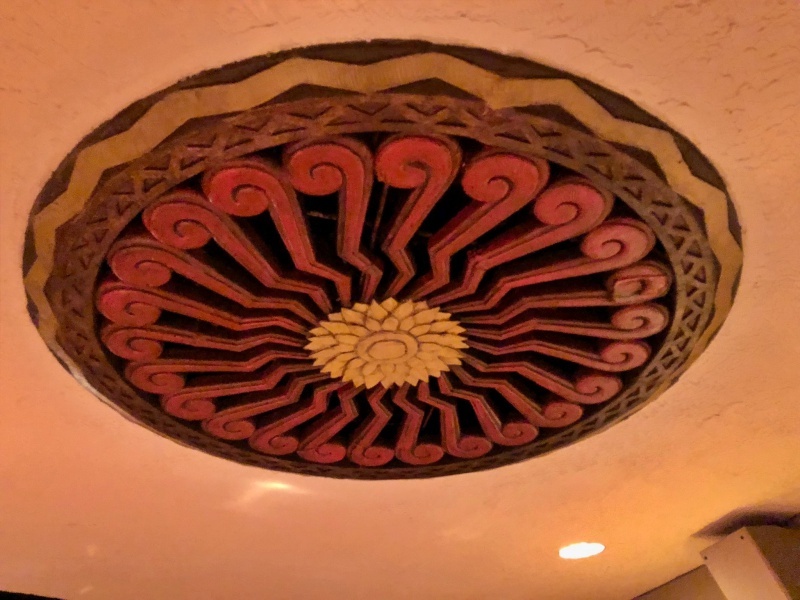 It is one of only two downtown buildings still utilized today as originally designed--as a theater. 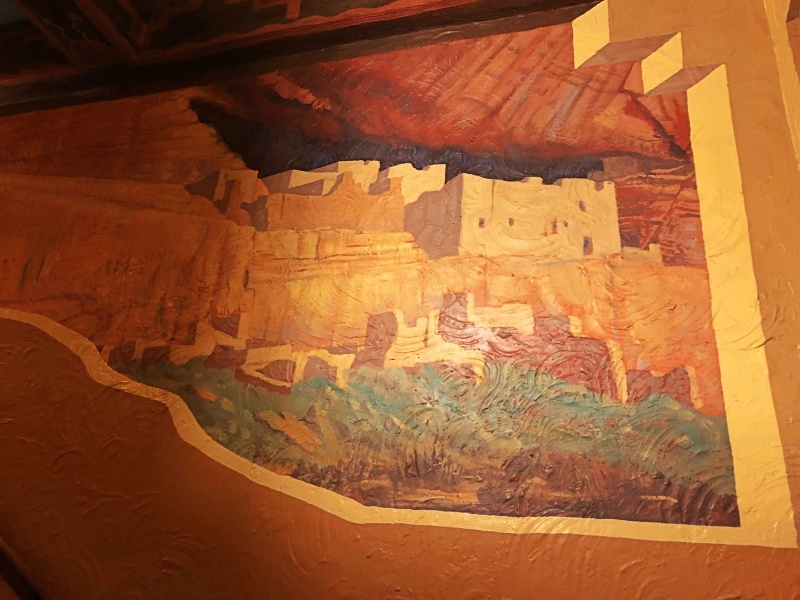 Below you can see one of the seven Carl von Hassler murals that adorn the mezzanine walls of the theater lobby. 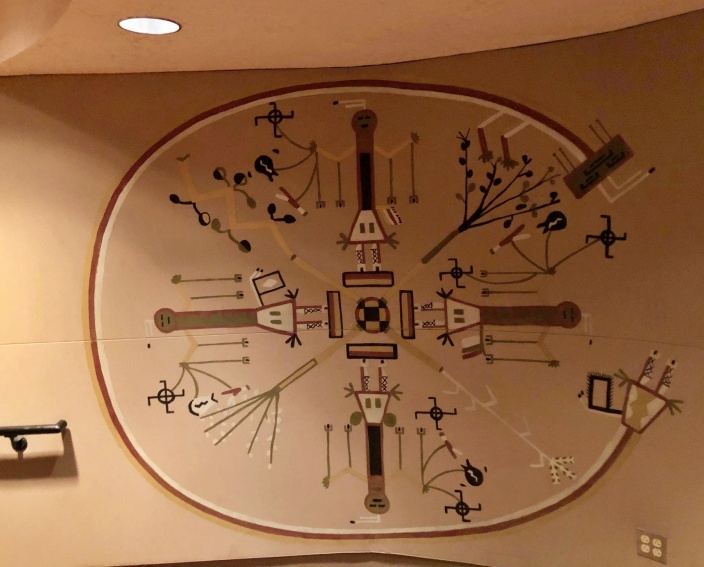 Called The Seven Cities of Cibola & created in the early 1930's, they depict his interpretation of the Pueblos, amid dazzling southwestern landscapes, which became a central theme of his paintings. 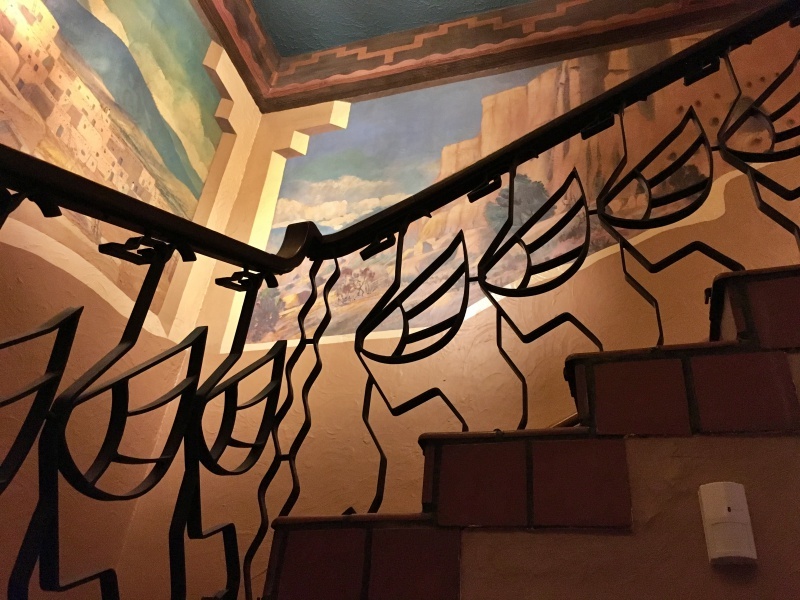 Further below is the amazing-to-see steel Sandhills Crane balustrades, followed by a scene looking across the balcony foyer. 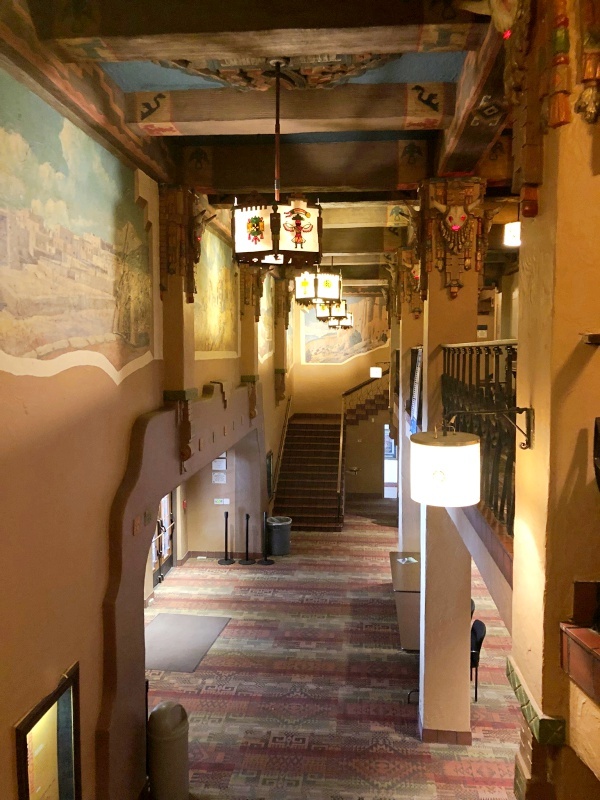 In the 1990's, the city received a grant to restore the theater as close as possible to it's 1920's grandeur. 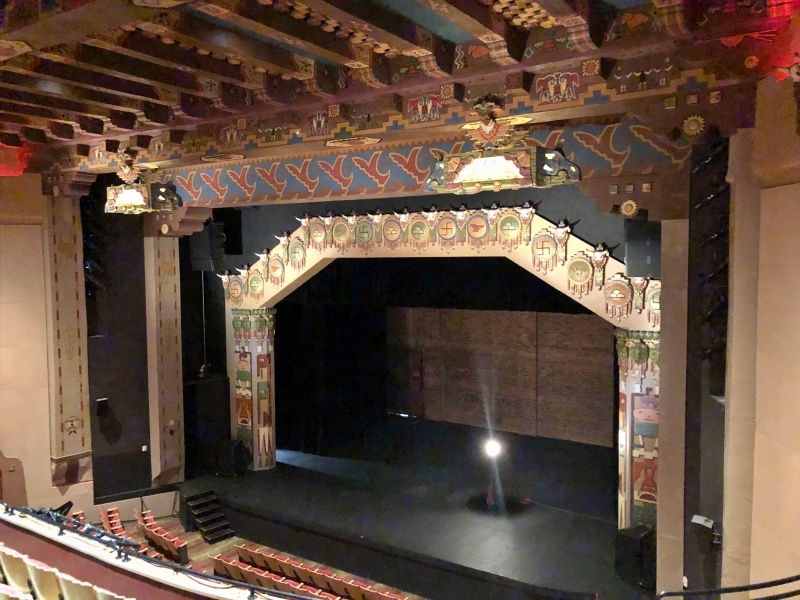 Another mission was to modernize it--that included enlarging the stage, reducing the seat capacity to 700 from 1000, & adding an 'acoustic wrap', which optimizes acoustic & semi-amplified performances. The renovations were completed in 2001. The diversity of current programming there is impressive: ballets, film festivals, actors' seminars, local productions, matinees & awards ceremonies are just a few of the offerings. 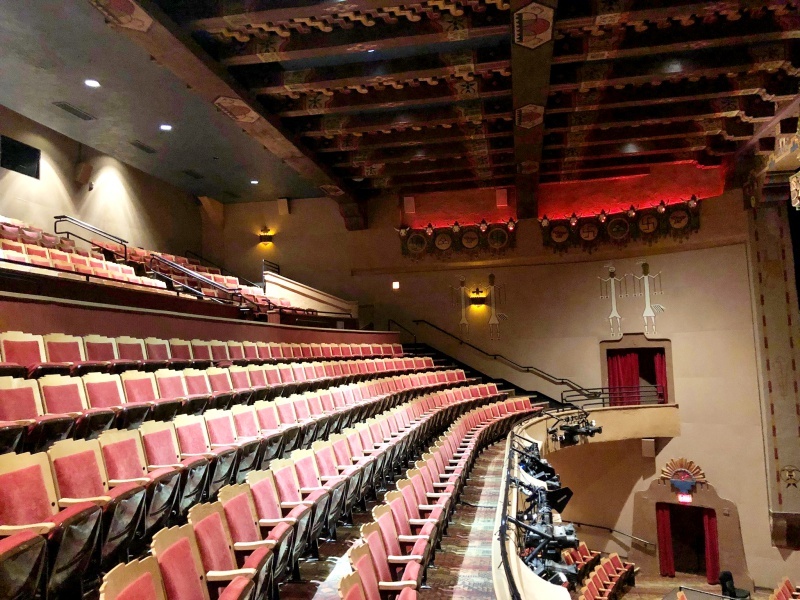 Between Labor Day & Memorial Day the KiMo Theater is rented to third-party groups, such as anchor tenants Ballet Repertory Theatre & AMP Concerts. You may also rent the space for film production activities, as a character from Breaking Bad & Better Call Saul did recently. 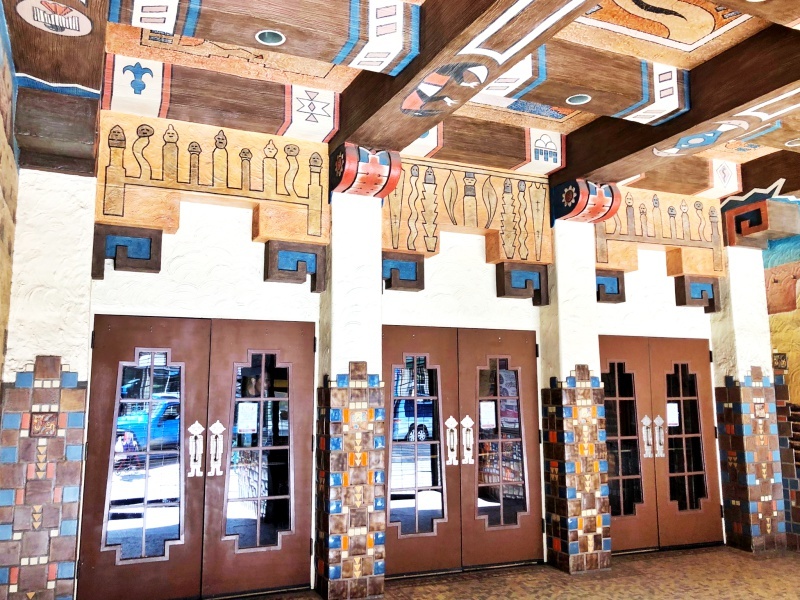 Inside the theater itself, the ornamentation, tilework & dramatic murals continue. Above is the empty balcony seating area, with carved viga beams & mesa-top-designed chairs. Below, the impressive stage is rather unique: a catwalk above is disguised behind the stage-length red birds viga, allowing for discreet passage over the stage. 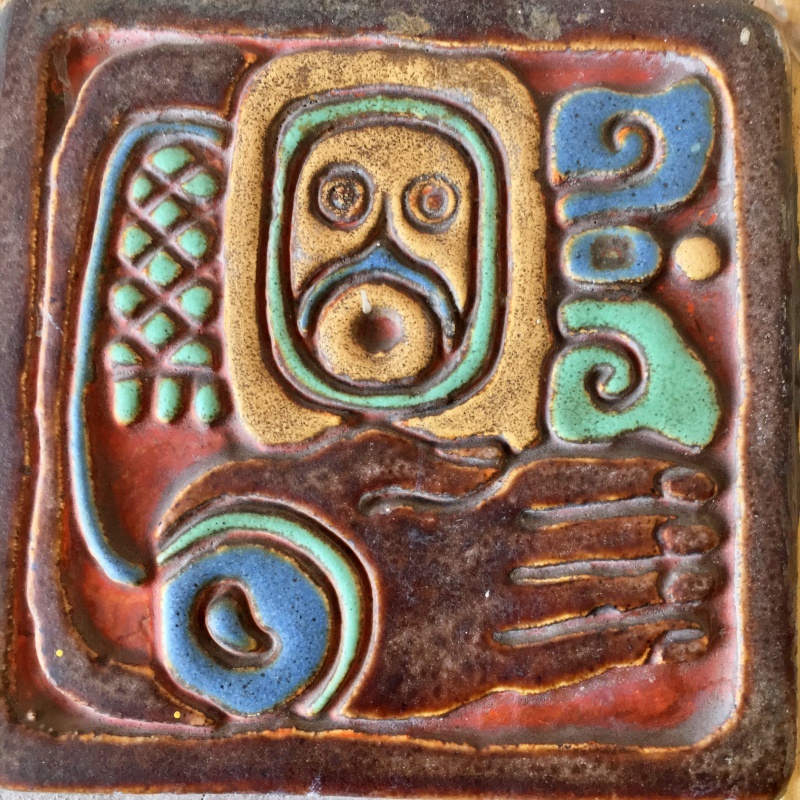 Below that is circular air-vent, disguised as an ornate petroglyph design. 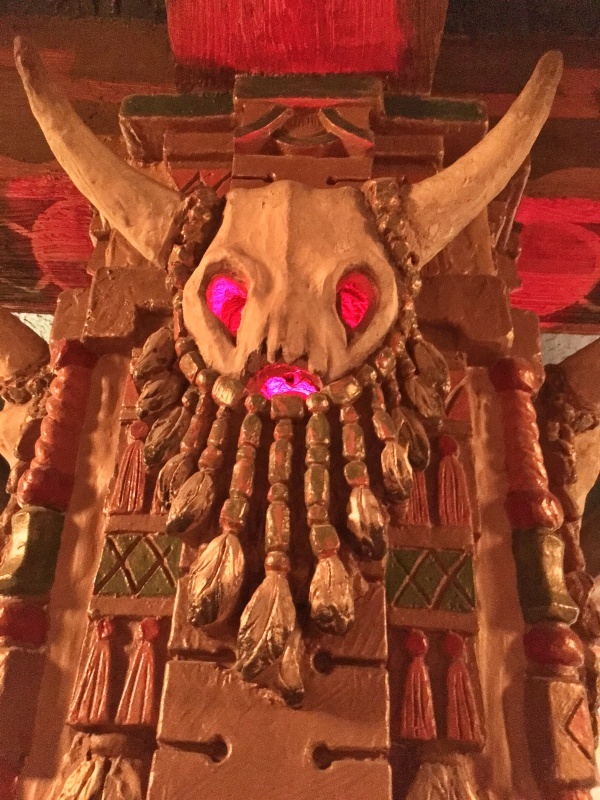 Above is a highly-decorated red bison skull light, one of 40 that adorn the lobby, mezzanine & theater walls. 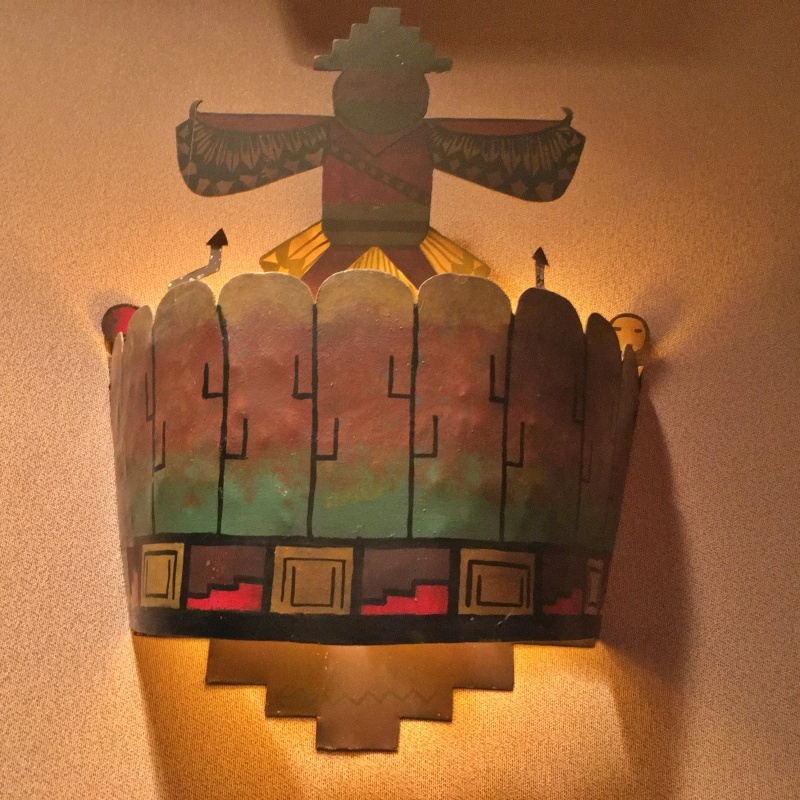 Below are five decorative sconces & other lighting fixtures scattered throughout the theater. 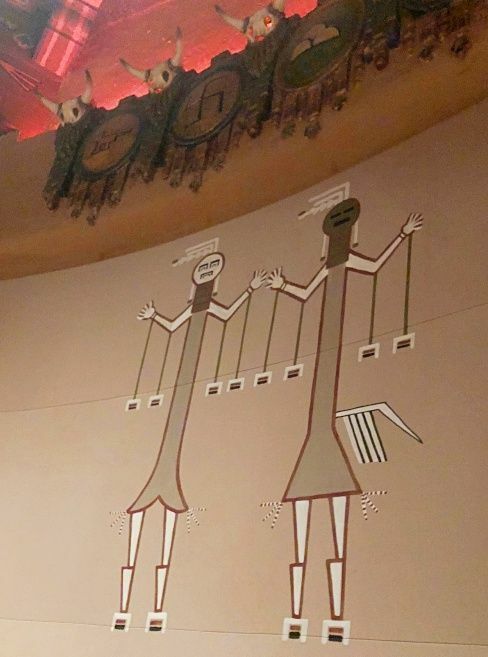 Besides the Carl von Hassler paintings, other murals are prominent throughout the theater, like the one above & directly below. 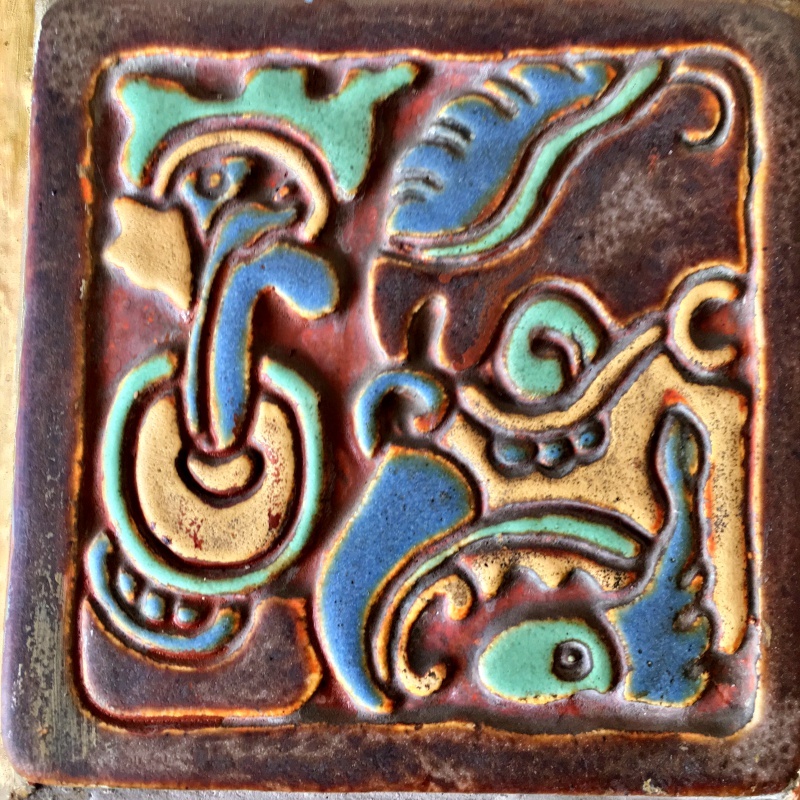 Intricate tilework, depicting stylized Pueblo Petroglyphs, are found mostly in the lobby; three examples are below. Spring is around the next corner...soon a plethora of weekly weekend open houses to view will be available. Open Houses are instructive, even if you are not planning to buy a property this year: you get to see how your neighbors live, you brush up on the newest designs & finishes, you can compare the home featured in the open house to your home's value, & many are interesting to see regardless of why. 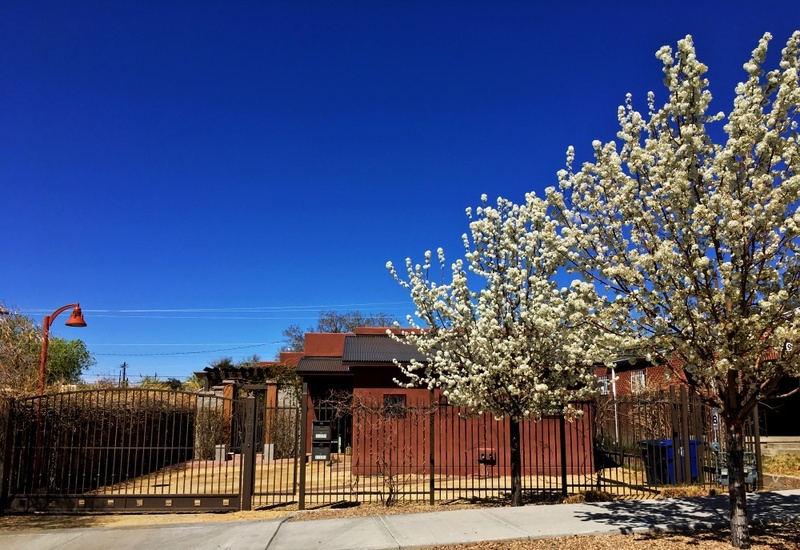 Wonderful gated, upscale two-bedroom townhome in historic Silver Hills neighborhood. Open House is Sunday March 3rd, from 1-3pm. The address is 1607 Coal Avenue SE. No public parking in the gated complex. Find out more about the property. The 9yo home, with lush, private courtyard, off-street parking space + garage, is adjacent to UNM/CNM, & has a spacious chic great-room with polished concrete floors & includes 11' ceilings, 42'' flat screen tv & audio system--both stay--central vacuum, unique LED pendant & recessed lighting system, Pella windows; courtyard has large glass sliders with built-in blinds, stainless appliances, solid-surface counters, durable TPO roof & A/C, app-controlled Nest thermostat, solid wood interior doors, alarm system & sleek ceiling fans. Enjoy the lush, private trellis-covered patio & the fully-landscaped gardens around the property. Fully-finished garage with storage. Come see! Copyright © 2018 Subrek Real Estate LLC., All rights reserved.